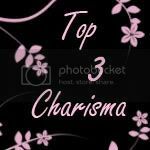 Thanks for joining us on our Magnolia Down Under Challenge Blog Hop, I hope your having a wonderful time. If you've been following the Blog Hop you should have arrived from the amazingly talented Kylie's Blog - Inklings from Kylie's Kraftroom and wasn't her creation just stunning! 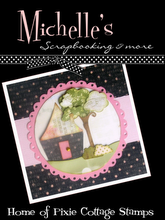 If you didn't and you've just happened upon my blog you can start the Blog Hop at the Magnolia Down Under Challenge Blog. 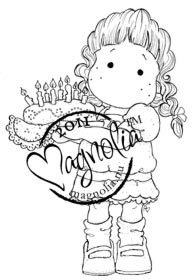 As we are hopping around and celebrating Magnolia Down Under's 2nd Birthday all our creations this challenge are featuring 2's. I've used a tealight candle card pattern and altered it to hold some little gifts. This is the front cover of my giftcard. 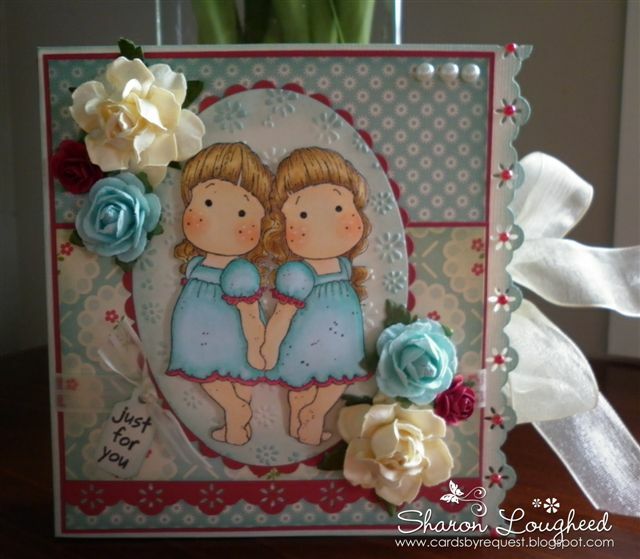 I've used two Tilda's (the twin stamp coloured with copics), two pattern papers from October Afternoon, two colours of cardstock (red and cream), two types of pearls (red and cream), two types of ribbon, two groups of flowers and finally a two tone colour scheme Red and Aqua! I'm going to giveaway my creation as Candy so if you'd like a chance to win please leave me comment! But to be eligible for my candy you'll also have to leave a comment with all of the other talented DT's along the hop! I'll randomly draw a winner at the end of the bloghop on the 19th. So would you like to see what you'll be winning? My candy includes Birthday Tilda (as shown below), two copic ciao markers BG15 and R46, two bunches of cream flowers (inside the box) from Wild Orchid and some paper doilies plus the giftcard I've made to hold them. Now if you'd like a chance to win even more goodies..... we'd love to have you join us in our TWO Challenge! ooooo sharon, what a clever idea. 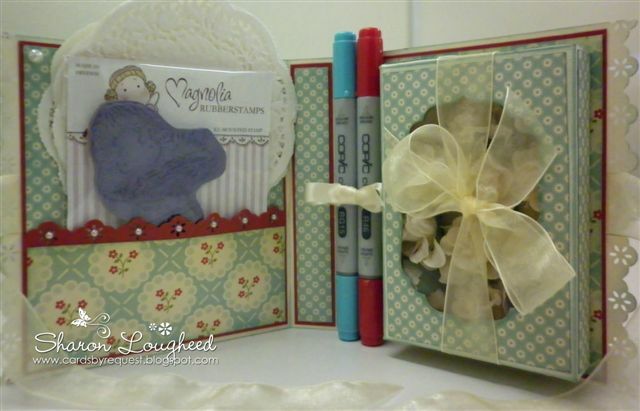 I love this little gift box, so clever and cute! What a fantastic creation. Thanks so much for the chance to win. Your gift box is amazing and so beautiful inside and out! OMGosh, thanks so much for the chance to win your awesome candy! Oh wow Sharon! This is just amazing! I love how you've put all of the goodies inside your gorgeous card! Stunning work! Thank you so much for being such a fantastic Teamie! Absolutely adorable gift/giftcard holder--very clever design. Beautiful! 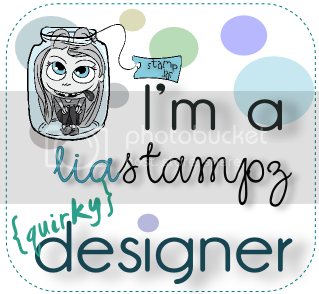 Love your DP's and your coloring is fantastic!! I've soo been itching to make one of these, just never seem to get it done, thanks for the inspiration and the chance to win! Just love the giftcard, such a good idea! Oh sweetie, what a lovely gift box! Great work! Awesome project! It's beautiful on the outside and tons of yummy fun on the inside. Thanks for a chance at the sweet candy. OH WOW Sharon - this is just totally AMAZING!!!! What a stunning idea and sooo beautifully presented! LOVE it my talented friend! I love the twin Tilda and how you colored them! I love the colors too, great card! Beautiful! You're so talented!! Happy 2nd Birthday! This is stunning!!! A gift in and of itself, and I love the colours, the papers are beautiful, as is that sweet little Tilda, or Tilda's? Very pretty!! I'm so glad I could come and share in the fun with you and the rest of the amazing talent at MDUC!! WOWSER!!! Just to receive your card was exciting enough, then you opened it, and so did my mouth. How exciting. 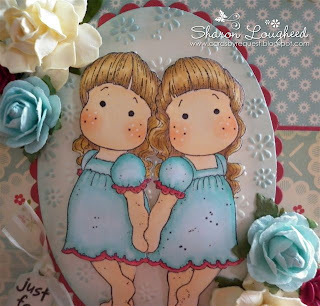 Gorgeous card, I love the twins and so beautifully coloured. What a gorgeous gift box card...and you are so generously giving it away. Someone will be a very lucky winner. Beautiful work! oh what a wonder job-fabolous!!!!!!!!!!!!!! !I just love it-congratulations!!!!!!!!!!!!!!!!!!!!!! Awesome work!!! Love just loooove this box! Beautiful colors and coloring!!! Hi Sharon, love the fact that you've used the twin Tildas as part of the 'two' items on your card, or at least I thought it was a card until I continued down your post - what a clever idea. OH MY!!! This is absolutely gorgeous Sharon!!! Your colouring and papers are stunning and love the flowers!!! Oh, how cute! Love your card! beautiful card i love the image you have used and wonderful colours. I'd love to win your project. It's just darling. You did a fabulous job on it, thanks for a chance to win. Wow your creations are so beautiful !!!! that is a Beautiful card!! i love it!! where can I find a tutorial for that card?? I definately want to try it! thanks for sharing! Wow gorgeous gift card. it's a wonderful idea. what a gorgeous gift card. Thanks for the chance to win. Your card is gorgeous!! Love all the sweet details!! Everything is so beautiful put together, a real masterpiece! I love your card! The colours you choose are great. Wow, what a great gift card. Love the pockets and the detail on the card is so pretty. Thanks so much for sharing. This is truly Gorgeous Sharon!!! Love the color combo and the detail is very nice :) Well done Hun!!! Thanks so much and congrats to MDUC for 2 years of fun!!! 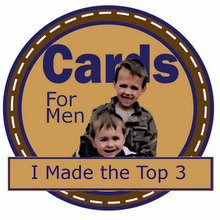 Your gift card/project is awesome! You really need to do a tutorial! Thanks for sharing your talent. Congrats on 2 years MDUC and thanks for the chance to win !!!!! Very pretty card. Love the inside idea. When you mentioned your card was the candy I thought cool it is beautiful but then you showed the inside and it was a bonus to see all the goodies. You are very creative and one day I would like to make one. Your creation is just gorgeous. 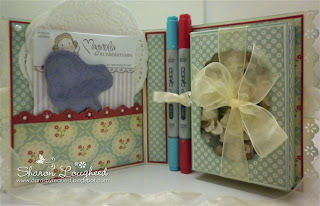 I love the gorgeous papers that you have used as well as your lovely coloration. Very special! Very cute card...love the colors and papers. Awesome! i love the box you made! That is a very good idea to give my mother on her birthday!! Thank you so much for the chance to win! What a beautifull box!! I love it. So cute ! 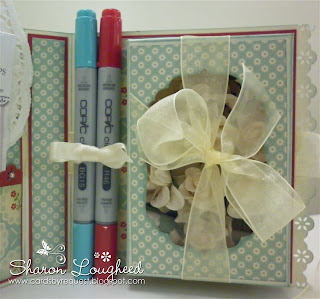 I love your card with that little box you included to put your yummy candy in. And the twin Tilda(s) are so wonderfully and match our theme perfectly. Feel really proud to be on this amazing team! The twins are a perfect idea for the 2nd birthday.. great card!! Oh My Sharon you card is fabulous! Love the image you used for the challenge and your colouring is gorgeous! This giftcard is a brilliant design and decorated so beautifully! look at that scrumptious candy too! Hope you are having a great week,hun! Wonderful, lovely and stunning gift card. Thanks for the chance to win. This is just stunning - how are you going to be able to part with it? The twins are the perfect choice! Love everything about it - the coloring, the colors, the embellishments are all fabulous! Thanks for the inspiration and the chance to win!